As Omaha’s preeminent fine art gallery, Anderson O’Brien Fine Art, is dedicated to the promotion of regional and national visual artists. We offer project design, appraisals, estate services, installation and consultation for either corporate or residential needs. The gallery offers an extensive collection of modern and contemporary art, sculpture, fine art photography. AOB is proud to represent over 90 artists working in a variety of media. We offer various painting styles, photography, ceramics, sculpture, prints, glass, jewelry other wearable art. We will work diligently with you to identify priority spaces in your home or office and review our inventory to find the right pieces for your needs. It is often difficult to imagine how a piece of art might look in your space so we offer an approval period for you to try out an artwork prior to purchase. For approvals, we just require a credit card on file before the artwork is released. Should your needs require a more specialized approach, we can arrange a commission for you with one of our represented artists. Our staff will work closely with you and the artist to facilitate communication regarding the creation and progress of a commission. Our clients tell us that being part of the creative process yields a very personal and meaningful relationship with the finished artwork. AOB’s services go beyond the acquisition of new art pieces. Our staff is available to you at your home or office to help identify optimal placement and secure installation of your purchases. We can also assist with re-installation of existing pieces, even those already in your collection to create the most beneficial presentation of your artworks. Our local shippers can give us cost estimates, prepare an item for shipping, provide us with tracking information and items as needed. Please call us for more details. Art appraisals are an important part of owning art, and for protecting your art investment. Our fine art appraisal services provide credentialed expertise in personal property valuation whether it is for a single work of art or an extensive collection. AOB welcomes the opportunity to work with interior designers. We know your time is valuable, so before you even visit us, we can curate a good selection of artwork options based on size, media, color pallette, style budget. Email us with your project needs and we can quickly prepare either an online or in person presentation for you. AOB has an extensive database on which to draw to help provide you with large scale or small space artworks, sculpture, glass or paper works to fit your design needs. We would be happy to submit a digital proposal, present our recommendations to a board and manage the installation. once artworks are selected for your project. Be it a single artwork or a multi-work curation, AOB will work to work within budgetary constraints and design preferences. AOB has had the privilege of curating corporate collections throughout the Midwest. Anderson O’Brien Fine Art currently has three locations to display art and serve the community. 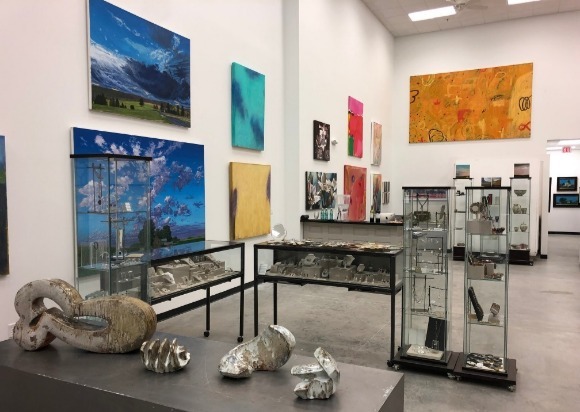 Farnam Street Gallery is our primary located and features storage of most of our inventory and is the site of artist openings, First Friday events and rotating exhibitions of our represented artists. Metered parking is available curbside or in the Midtown parking garage with 3 hours free parking with validation. The Empire Room Grand Gallery location regularly hosts group and solo shows and participates in Midtown Crossing First Friday events. 200 So. 31st Avenue, Suite 4107 at Turner Park in Midtown Crossing. Stop by First Fridays or visit by appointment. Please call AOB Fine Art at 402-884-0911 to make arrangements. The Omaha Design Center Gallery is the center for our special events and large scale exhibitions. We welcome your visit by appointment only.